The Elliot mini pendant from Mitzi collection is chic look with a vintage styled aged brass finish and single bulb design. This new take on a vintage favorite from Mitzi collection is sure to attract attention. Designed around an aged brass finish urn centerpiece, the Elliot mini pendant features a carved glass adaptor which connects a vintage filament-style bulb for a classic look. By Hudson Valley, Elliot is great for home and commercial use, especially when used to accent long countertops and cafe tables. 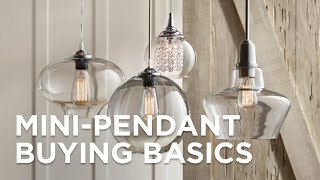 The Sadie small mini pendant has a delicate look with its clear glasswhile the aged brass finish offsets this airy aesthetic.